Today we continue our countdown of the Top Ten moments from Season One of Star Wars Rebels, as chosen by SWU readers! 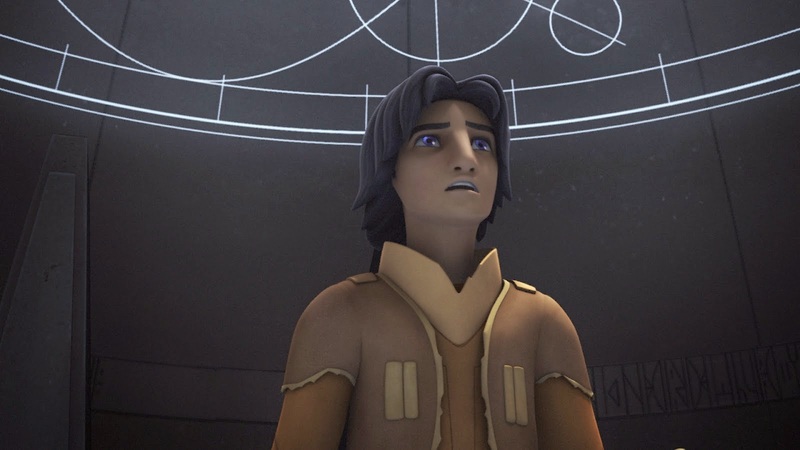 We examine a major turning point in the unfolding story-arc of Ezra Bridger in the episode entitled 'Path of the Jedi'. The Force has always been one of the most mysterious and intriguing aspects of Star Wars and no character better embodies what the Force is all about than Master Yoda. Through the first half of the season we saw Ezra begin to learn how to tap into the Force, but he never really knew how to control it. Until he met Yoda. Ezra's journey in the Jedi temple on Lothal brought everything into perspective. In the first half of 'Path of the Jedi' he was forced to face his fears and only once he made through to the other side did he truly begin his journey to become a Jedi. It was only right that it was Yoda who guided Ezra on this journey was a highlight of the season. Yoda showed Ezra the true nature of the Force and showed him the real reason he was becoming a Jedi. This moment represented a turning point in Ezra's journey. After having tapped in to the Dark Side in the previous episode, having Ezra talk to an embodiment of the light side, Yoda, helped steer him down the right path. As we have seen throughout the week, there have been a myriad of memorable sequences in the first season of Star Wars: Rebels, but this particular moment certainly stands out against the five others we have seen so far. Yoda makes his incorporeal debut on the TV series! The significance of this scene in the context of not just the series, but Star Wars in general, is certainly tangible. Yoda is one of the all-time beloved and endeared characters in the Star Wars Universe and to bear witness to his return in the series was incredible. In addition, Yoda was voiced by the one and only Frank Oz which just added the aura of legitimacy marking the Yoda's appearance. This combined with the audio cues of the 'force theme' composed by Kevin Kiner served to enhance the tantalizing and gripping nature of the scene for Star Wars audiences. I particularly enjoyed the call backs to the Clone Wars, as Yoda has now assumed the new mantle of a deit-like force user following the trials and tribulations encountered on the Force Planet from Season Six. However, this scene was not all about Yoda. Ezra's journey takes another twist. Ezra passes the Jedi test and acquires a kyber crystal. The tone of this sequence was reminiscent of the experience that Luke Skywalker endured on the cave in Dagobah coupled with the younglings trial on the planet Illum in 'The Gathering'. Ezra has advanced to a level now and it was extremely fitting to have Yoda be the guiding spirit that bestowed Ezra with the title of 'young Jedi'.